MILAN — Gian Piero Ventura’s reign as Italy coach ended on Wednesday after a World Cup qualifying fiasco during which the four-time champions failed to reach next year’s finals in Russia. "As of today Gian Piero Ventura is no longer the coach of the national team," the FIGC said in a statement. According to reports, Ventura will be paid his salary until the end of his contract in June 2018, which amounts to approximately 800,000 euros (US$943,000). 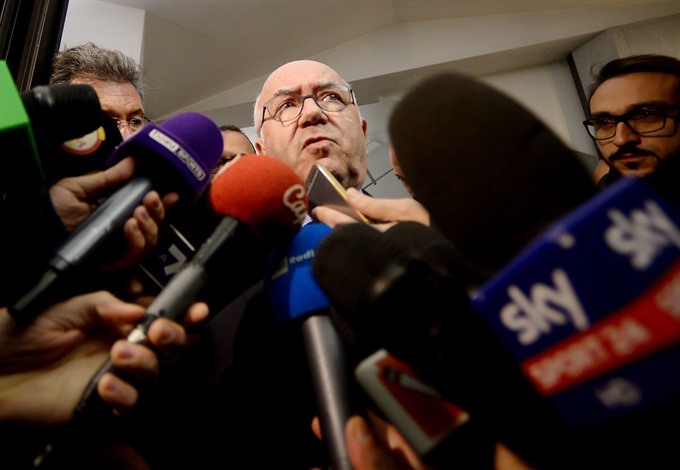 "The federation president (Tavecchio) informed participants at the (crisis) meeting... of the impossibility for him to resign," a FIGC statement read, awaiting "a series of proposals" on how to fix Italian football. "We are considering big names for the role of coach," the 74-year-old promised. "There doesn’t appear to be the mood for change," the former Roma midfielder told journalists. "Tavecchio has decided not to resign and continue with his office. "The others haven’t taken a position and said they’d decide in the future. "We need credible elections, with new people; we won’t solve the problems of Italian football by sacking the coach. "If not, we’ll keep stirring the same soup which has proved indigestible to so many." Ventura, meanwhile, had defended his leadership as "one of the best records in 40 years" despite failing to lead the 1934, 1938, 1982 and 2006 winners to their 19th World Cup. "I lost only two games in two years," he had told Italian television.